Based on Yuling's love for nature, the Dakota Rehearsal Dinner Invitation & Envelope features organic forms and wispy lines inspired by the coastal landscape. The fluidity of the layout of the text echos that of the imagery. The natural fibers of the envelope stock pair beautifully and add tactility. This piece is flat printed single-sided on luxuriously thick cover stock with a subtle eggshell textured finish. 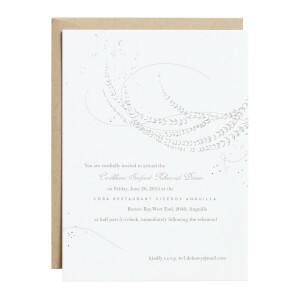 $484 for 100 flat printed Rehearsal Dinner Invitations and matching matte colored Envelopes.